Thank you to all who attended our successful annual Quiz Night on Wednesday 31st January 2018. Congratulations to our winning team from Wreake Valley Rotary Club winning with a score of 123, followed by close second Knights of St Columba with a score of 117. The Queen Victoria, for their generous donation of use of their room and selection of sandwiches that everyone thoroughly enjoyed. Terry Jackson for his donation of time to prepare the quiz questions. On behalf of all at Inter Care, thank you! 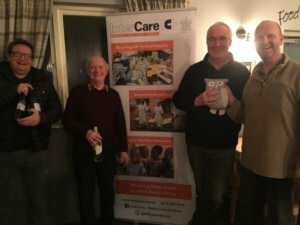 The evening was a huge success raising £699 (including Gift Aid) this could sent over 160,000 sterile gloves to our partner health units in rural sub-Saharan Africa. Vital Personal Protective Equipment in infection control.